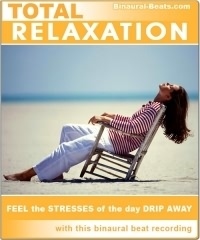 Revitalizing the entire body with a deep "cat nap"
Using the Total Relaxation MP3 couldn't be simpler! Like all our binaural beat recordings, simply slip on your stereo headphones and press the "Play" button on your MP3 player. The binaural beats will automatically begin affecting your brainwaves, and you'll soon realize the benefit - pure relaxation and ultimate stress relief! You're stressed. You've worked so much this week. You have deadlines, pressures, financial issues. You need a week at a relaxation spa. But you're happy, as you know you CAN have just that. You sit back, hit "Play" on your MP3 player and begin to chill out. As the gentle sounds swish around in your head, you begin to feel your body slowly relaxing, muscle by muscle. You don't feel sleepy or drowsy... in fact, you're starting to feel quite euphoric... you can really start to appreciate and enjoy exactly how relaxed you truly are. Your body feels totally light and your mood is perfectly serene. You wish you could feel like this every hour of the day. Your mind is no longer dashing around with thoughts of stock markets and "To Do" lists. Instead it is playfully contemplating the Universe... thinking about how warm and soft your sofa feels... all as your brain creates and releases natural serotonin relaxants, making you feel just great. It sounds clichéd and you know it... but you feel at one. With everything. Slowly, after an hour, the session ends... but your mood and relaxed nature continue. This has been a fantastic session. Suddenly nothing is a problem. You're simply happy... happy that after your virtual week at the relaxation spa, you can really feel this good. "I now routinely listen to this MP3 every night... totally tranquil! ... And the tones are so deep, I'm asleep within minutes"